We are thrilled to announce that Choithrams has been awarded the GCC – Best Employer Brand Award in an event organized on October 03rd, 2018. 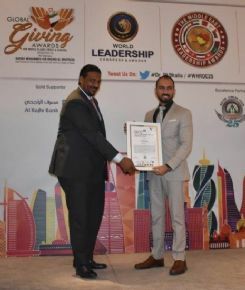 Given by the Employer Branding Institute & World HRD Congress, this year’s award recognized leading GCC Organizations who promote an authentic work culture, diversity, inclusion & employee engagement. This award is the latest in the string of accolades bestowed on Choithrams for its efforts to build a work environment that promotes genuine team work & nurtures the welfare of its employees. We have always laid a strong foundation to promote the welfare of our staff members through training & continuous learning. This is crucial in our direction & strategy to sustain our lead as one of the most trusted companies in the industry. On this achievement, our CEO, Rajiv Warrier says, “This award is an honor and vindicates the importance that we as an organization give to employee engagement, diversity and fairness at the workplace. I would like to congratulate each of our employees for their contribution in making this award possible.” Being the recipient of this award reflects our commitment to observe the highest standards and it will inspire us to consistently work towards advancing our employees’ personal & professional happiness. This award undeniably belongs to each & every employee of this organization.